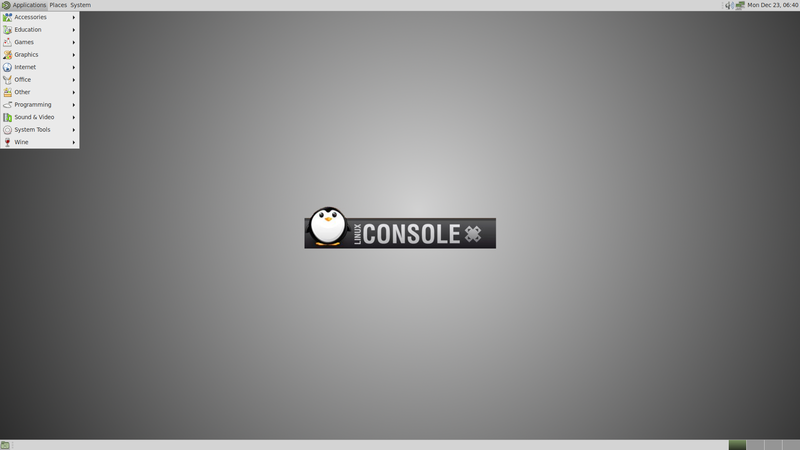 Rate this project Yann Le Doare has announced a new release of LinuxConsole, a lightweight, independent distribution whose editions feature the LXDE and MATE desktop environments. The new release, LinuxConsole 2.5, includes versions 4.1 and 4.4 of the Linux kernel, offers support for booting on UEFI-enabled hardware and provides many games. The 32-bit build runs the LXDE desktop environment while the 64-bit build comes with MATE as the default graphical user interface. "LinuxConsole 2.5 is out. This release is designed to be used with children - it's easy to install on old computers with the included Windows Installer. A lot of games and music software are available for use. Both releases boot with BusyBox 1.24.2. Core software and libraries are stored on a Squashfs file system." Screenshots, along with a complete list of featured games, tools and educational software that can be found in the distribution are featured in the release announcement on the project's front page. Download: linuxconsole.2.5-x86_64.iso (1,657MB, MD5), linuxconsole.2.5-x86.iso (682MB, MD5). Also available from OSDisc. Yann Le Doaré has announced the launch of LinuxConsole 2.4. LinuxConsole is an independent, lightweight distribution which offers easy installation steps and a simple desktop environment, provided by LXDE. The latest release ships with version 4.0.5 of the Linux kernel, the Qupzilla web browser and new Chinese and Russian locales. "This release is easy to try or install. It could be installed on computers used by children or teenagers. You can install many games, educational, Internet and music software. The CD ISO contains all libraries, the LXDE Desktop, drivers and the game SuperTuxKart. The DVD ISO comes with many applications, like LibreOffice or the game 0AD. A new tool is also available to install third-party software, like Google Chrome, Mozilla Firefox, Steam and Skype." Further information on this release, along with a screen shot, is available on the project's home page. Downloads: linuxconsole.2.4-x86.iso (677MB, MD5), linuxconsole.2.4-x86-DVD.iso (3,485MB, MD5). Yann Le Doaré has announced the release of LinuxConsole 2.3, an independent Linux distribution made for game consoles: "LinuxConsole is primarily designed to turn old and semi-old computers into game console centers. The LXDE desktop includes some utilities, scripts to install Firefox 34, Flash player and Google Chrome), and system-management functions (like installing printers). As a bonus, a lightweight package manager called opkg-gui allows you to install and run stable source packages to fill out the basic live CD with the latest software. Several categories are available: games, office, system, education. Based on the goal to revive old computers, this distribution works well on old and semi-old computers with low resources (as low as 256 MB of RAM), it runs on old and new video cards (Intel, NVIDIA, ATI), it can be turned into a live USB image, and it can be installed as a dual-boot system with Windows. Features: locale support for English, French, Spanish, Italian, German, Portuguese and Breton, Linux kernel 3.14.26...." Here is the full release announcement. Download: linuxconsole.2.3-x86.iso (700MB, MD5). Yann Le Doaré has announced the availability of the third beta release of LinuxConsole 2.3, a distribution designed for game consoles: "This is the last beta before LinuxConsole 2.3 that should be out in December. What is new? 32-bit and 64-bit releases; new installer based on GRUB, you can now install LinuxConsole on an empty disk; you can now install office, graphics and multimedia packages, not only games; GTK+ 3 and Qt 4 libraries are now available. Why use it? With a lightweight init script and minimal daemons, it works fine with old computers; you can use your computer for gaming (warning - to use Steam, install the 32-bit edition, the 64-bit one is not multilib-compliant. What is inside? Linux kernel 3.17.2 (64-bit) and 3.14.23 (32-bit); LXDE desktop; NetworkManager, an easy tool for wired and wireless network setup; opkg package manager; Qupzilla as default web browser...." Continue to the release announcement for full details. Download: linuxconsole.2014-11-13-x86_64.iso (695MB, MD5). 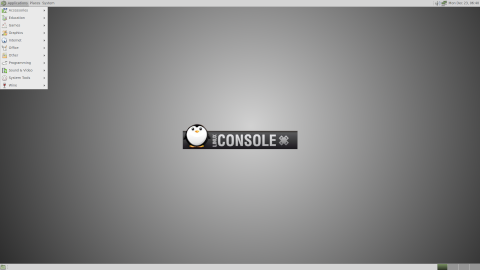 Yann Le Doaré has announced the release of LinuxConsole 2.0, a major new version of the project's Linux distribution designed primarily for game consoles: "LinuxConsole 2.0 is ready. Features: fast boot; should run on old and new video cards (Intel, NVIDIA, ATI); live CD and live USB; can be installed as a dual-boot system with Windows. Games list: OpenTTD, Tux Paint, 2H4U, BZFlag, Cultivation, ETR, Neverball, XMoto, Frozen Bubble, Danger from the deep, Do'SSi Zo'la, fooBillard, Freecraft, Supertuxkart, Teeworlds. What is new: LinuxConsole is now built from Dibab; the code has been rewritten from scratch; it is very simple to build it, you don't need root access; you can install DEB packages, all binaries are built, but there is great compatibility with the Debian ones. What is inside: BusyBox 1.21.1, Linux kernel 3.12.5, Mesa 9.1.6, X.Org 1.14.3, NetworkManager 0.9.8.6, LXDE (git release), Firefox 26.0 (with a tool that downloads it from Internet)." Here is the brief release announcement. Download: linuxconsole.2.0-x86.iso (630MB, MD5). Yann Le Doare has released LinuxConsole Linux 1.0.2010, an independent distribution with the goal of being as easy-to-use as a game console. Features: "Very fast boot - using Dash instead of Bash, using initramfs instead of initrd, modules management completely rewritten (no more cache, all modules mounted once), LXDE is started in 4 seconds when booting CD in VirtualBox; LXDE/PCManFM now default session; IceWM/Rox Filer can also be used; LXLauncher will be used for the game center; new module management with lcmtool; new tools - select time zone, wicd can be used to set up wireless connexions; install it on live CD or live USB; applications - latest Firefox, Thunderbird, Flash player, X.Org Server 1.9.2, Linux kernel 2.6.35.8, BusyBox 1.17.2, NVIDIA driver 260.19.29...." For further details please see the full release announcement. Download: linuxconsole1.0.2010-cd.iso (530MB). Yann Le Doare has announced the release of LinuxConsole 1.0.2009, an independently developed, easy-to-use desktop Linux distribution with multimedia support and games: "LinuxConsole 1.0.2009 is available in four formats: Multimedia (200 MB ISO image, for old computers and system with little disk space, Linux kernel 2.6.30.5, IceWM + Idesk + ROX-Filer, Firefox 3.5.3 + Flash 10 + MPlayer Firefox plugin, MPlayer SVN, X.Org 7.4); CD (Multimedia modules, GNOME, CUPS, GIMP, GCompris, FooBillard, Frozen Bubble); DVD (CD modules, ATI Catalyst 9.9, NVIDIA 185.18.36, 3D Games, VirtualBox 3.0.6, PlayOnLinux); Jukebox (build your personal ISO image, for example if you want to play OpenArena on a recent ATI card, select OpenArena and ATI Catalyst modules, then click to build ISO)." See the complete release announcement for further information and BitTorrent download links. Yann Le Doaré announced a new release of LinuxConsole, an independently developed, modular Linux live CD: "This '1.0.2008' release has been built from a new toolchain based on gcc 4.2.2 and glibc 2.7. The 2.4 kernel is not available for that release, but you can continue using 2007 ISOs if you have to install linuxconsole on very old computers. The kernel is 2.6.25.4, patched with squashfs (module format for linuxconsole) and aufs (can write on modules). Since bootsplash is obsolete, usplash replaces it. GNOME is available in 2.20 release, since it's very stable; an update to 2.22 will be available soon. KDE is in 3.5.9 release, but not present on CD (not enough disk space). You can install it with modules manager or wait the 'DVD' release... DVD release will be ready in September." Visit the project's home page to read the full release announcement. Download: linuxconsole1.0.2008-cd.iso (681MB, MD5). Yann Le Doaré has announced a new release of LinuxConsole, an independently developed, modular Linux live CD: "LinuxConsole 1.0.2007. This official release brings lots of new features: NTFS-3G - no more limitation when using NTFS partitions; 2.6.20.1 kernel; X.Org 7.2 (Games3D ISO); GNOME 2.18 and GParted (CD ISO); Busybox 1.4.2; lcinstall.exe updated to avoid losing 'config.sys'; eject CD when used in live CD mode; many system tools added; Evolution updated to 2.10, Firefox to 2.0.0.4.... Many tests have been successfully done: old computers (16 MB RAM), new computers (serial ATA and 3D drivers), booting from CD, hard disk, floppy, network, and installing from MS Windows 98, 2000, XP and empty disks." Visit the project's home page to read the full release announcement. Several different editions are available for download; here is a quick link to the CD edition: linuxconsole1.0.2007-cd.iso (696MB, MD5).